A two-week adventure tour inspires one traveler to cancel her flight home and do some exploring on her own. DURING MY 15-DAY guided Adventure Center tour of Turkey, our group managed to travel by train, bus, boat, and balloon, covering around 1,700 miles of the western part of the country. We visited cultural, religious, historic, and natural sites in villages and cities, and spent an evening in a local’s home. By the end I was brimming with new knowledge and interest in a country that I’d previously known almost nothing about. As the trip drew to a close, though, I decided I wasn’t ready to leave. So I canceled my return flights and stayed for a while. At over 480,000 square miles, Turkey is much larger than I’d thought. My original plan had been to travel into the eastern part of the country and map a route back through the west into Istanbul, but a few days into my new adventure I was warned about a military skirmish on the Syrian border. News of Muammar Gaddafi’s death reached me a few days after that, and three days later there was a massive earthquake in the eastern city of Van. All signs were pointing west, so in the west I stayed. I spent an additional 21 days in Turkey, bringing my total visit to five weeks. Here’s what I saw. I visited Istanbul three times during my stay in Turkey but I could barely tell you anything about what was happening at street level. My gaze was always pulled to the skies by one dramatic vista or another. I love this scene of seabirds circling over the dockside fish sandwich sellers at sunset. Istanbul's Grand Bazaar is famously packed with tourists and locals jostling their way through the covered hallways. Imagine my surprise to come on this quiet annex - the book sector. In a practice reflective of Turkey's shamanic roots, people make wishes by tying scraps of fabric to the branches of a tree. In the background, a rancher leads his horses to a nearby corral, and behind you can make out the telltale human-made geometry of doors and windows cut into the rock formations. Viewed from the air, Cappadocia's terrain takes on a particularly surreal quality. After a dozen minutes hanging over the edge of our basket frantically snapping photos of a sky filled with an estimated 80 balloons, I was awed by the brilliance of the sun finally cresting the far-off the mountains. Antalya’s marina is adjacent to Kaleiçi, the historic city center which is also home to Hadrian’s Gate. With its market stalls and frequent boat tours, the area is popular with tourists, but locals still fish off the pier and nearby rocks. A caravanserai was a roadside inn, typically found along the trade routes between Asia, North Africa, and parts of Europe. Essentially ancient truck stops, these structures were walled, with restaurant facilities, parking stalls for travelers' wagons, and (sometimes) baths. This caravanserai, located on the motorway between Konya and Antalya, opened into a walled courtyard where two identical dogs slept in matching poses. An ornate, covered chapel was accessible on the far side. Historically, Kayaköy was home to a community of about 2,000 Greek Christians who were sent to Greece in the population exchange agreement struck between the Greek and Turkish governments in 1923 at the end of the Greco-Turkish war. Based on religious identity, the exchange - which affected an estimated 2 million people - involved the compulsory relocation of Greek Orthodox citizens of Turkey and Muslim citizens of Greece. Relocated Muslims chose not to inhabit Kayaköy, and the village now stands empty, but still somewhat intact. Opened in 1999, the Lycian Way is a marked hiking trail covering the ~500km between Fethiye and Antalya along Turkey’s Mediterranean coast. Designed and implemented by trekking enthusiast Kate Clow (who also created Turkey’s St. Paul Trail and Kaçkar Trail) the Lycian Way is named after the ancient civilization that once ruled the area. Our Adventure Center group took an afternoon to walk the segment between Kayaköy and Ölüdeniz, which took about 2.5 hours. As we hiked along the mountain pass, two speed boats were racing in the bay below, their jet streams creating this nearly perfect ampersand. About a week into our adventure tour, we boarded a boat for a day-long cruise of the sights in the Mediterranean near the village of Kas. We dropped anchor five times. At the second stop, most of our group went over the port edge to swim in the remains of a sunken city but I stayed on deck to photograph this woman who had paddled up starboard to fish. Kaleköy (literally, “castle village”) is built in a Lycian necropolis. A Byzantine castle sits at the highest point, and sarcophagi litter the perimeter area, lending the place a distinct Led Zeppelin cover-art feel. This sarcophagus is built in the shallows, earning it its colloquial name - the "floating sarcophagus." An ancient Greek and later Roman city with a population of more than a quarter million, Ephesus was one of the largest metropolises in the Mediterranean world. Despite mob violence (401 AD), an earthquake (614 AD), and the depredation of time, the ruins are intact enough to give the impression of the city's former grandeur. Some structures, like the public toilets, have survived largely unbroken. The intricate and imposing Library of Celsus is also still standing. This theatre, first constructed in the Hellenistic period (3rd century BC), is the largest in Anatolia with a seating capacity of 25,000. Our group entered stage-level, through the tunnels gladiators would have used, and the thrill was only slightly diminished by the scaffolds that were in place as part of the structure's restoration. The fish market in Fethiye is a collection of stalls surrounded by a starburst of adjacent restaurants in an open courtyard. Visitors can buy the fresh catch of the day to go, or to hand to any of the eager waiters standing by who will deliver your selection to their kitchen staff in a "you buy, we fry" arrangement. From the pay turnstiles at the site entrance just off the tour bus-filled parking lot, Pamukkale looked like it was nothing but tourists in swimsuits. The water in the area is thought to have healing properties, and visitors were lining up to soak in the few pools that remain open to the public. After decades of development that degraded the natural environment, in 1988 the area was declared a World Heritage site and the Turkish government began to take preservation and restoration measures. As a result, visitors are limited to a few areas on the travertines, but a short walk away from the crowd along a wooden footpath there's a completely different Pamukkale. Though contact with the travertines is prohibited on this side, it's the perfect place to observe the naturally occurring terraces and to take in the view of the surrounding areas of Denizli province. Pamukkale (which means "cotton castle" in Turkish) is the site of an ancient city called Hierapolis which was built among the area's naturally occurring hot springs and travertines, carbonate mineral deposits that have formed into white terraces. Some ruins remain at the site, such as the toppled Byzantine columns submerged in the hot springs. Gözleme is an enormous, paper-thin pancake that's rolled out on a dowel and stuffed with savoury fillings like cheese, spinach, or minced beef and cooked on a flat grill. Also available: sweet dessert gözleme with tahini, honey, or nuts. Situated just fifteen minutes walking time along the beach from its more-famous sister village Olympos, Çıralı is an agricultural village about an hour and a half outside of Antalya. I stopped here on a whim and ended up staying for five days. On my last day I woke up early and walked down to beach to watch the sun rise. Once I decided to make my way back up to Istanbul from the Mediterranean coast, I took a night bus to Izmir and booked an overnight train to Istanbul leaving that evening. In Izmir, I found a cafe with an actual espresso machine pumping out frothy cappuccinos made with Lavazza coffee (contrary to popular belief, most Turks serve Nescafe) and spent the day writing among the city's young people. Happy and relaxed, I decided to stay another night but when I got to the station my train was in the bay and there was a long line at the wicket. To my enduring regret, I left as planned. Fruit is a big part of the Turkish diet, with fresh slices of melon and citrus showing up on nearly every breakfast plate. Turkey is covered in orange and pomegranate orchards, and fresh juices are a staple quick snack, even after dark in the country's largest city. When you think of Turkish tiles, you're probably picturing the ornate blue and white geometric floral designs of the İznik tile. The 16th-century Rüstem Pasha mosque, which is accessed through a humble doorway at street level in the Hasircilar Çarsisi (Strawmat Weaver’s Market), is famous for the quantity and period (mid-1500s - early 1600s) of these decorations. 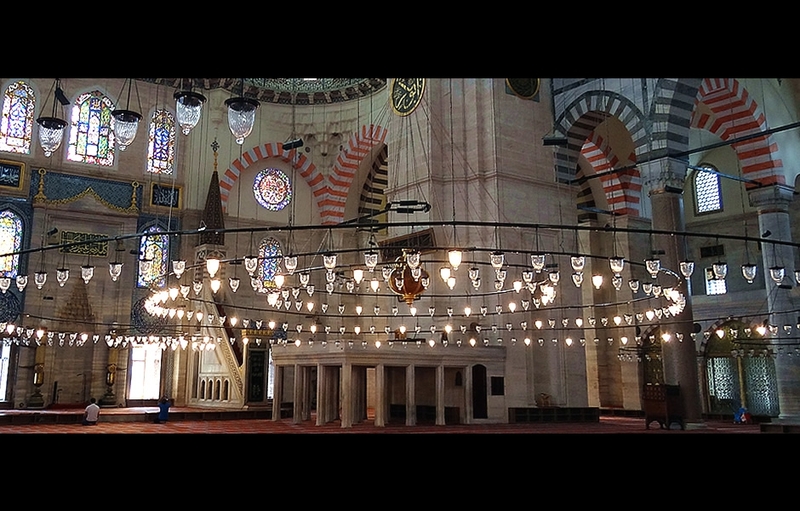 A major attraction in Istanbul, Süleymaniye is an exemplary Ottoman imperial mosque.